In this video, Proofpoint Director of Market Development Keith Crosley describes the quality of Brafton content (at scale! ), conversion-focused strategies provided by his content marketing strategist and why Brafton is “one of the favorite services” he’s deployed. In the competitive security as a service industry, Proofpoint sets its brand apart by constantly developing products to keep pace with evolving user needs. Still, it lacks resources and writing skills to effectively communicate its authority and draw leads from across the web. Director of Market Development Keith Crosley looked to Brafton as an affordable, reliable content marketing vendor. Brafton’s writers create nuanced articles relevant to Proofpoint’s offerings, and the content is used to fuel the brand’s social marketing as well. You can check out the full testimonial transcript below. 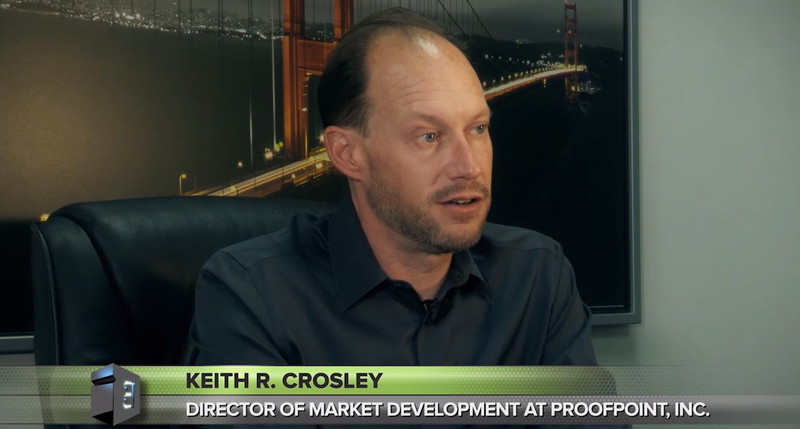 I’m Keith Crosley, director of market development at Proofpoint Inc., and we’re a security as a service vendor, so we do things like email security, archiving, data-loss prevention, and all of that in the cloud. I had another counterpart who had seen one of these feeds and he was like, “How did they do this? They must have great writers.” And I said, “No, no, let me check that out and, it turns out, it was Brafton. So, that kind of competitive impulse is what really caused us to buy the product. And it’s really impossible to generate the volume of content you want to use in your marketing efforts in the way that a service like Brafton can do, so it’s cost effective, easy to use, the setup was very quick and we’ve seen a lot of benefits from using it. Brafton was completely able to customize the content to our needs, so I think Brafton really understands and that’s one of the things I think is really impressive. Even in markets that seem highly technical and very niche, Brafton has writers who have experience in those fields and, if they don’t, Brafton’s writers can develop expertise very quickly. 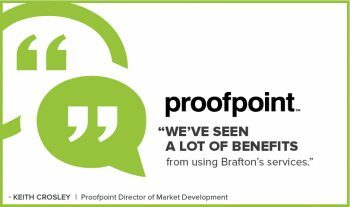 The Brafton content has helped us establish a presence in new markets very quickly and, within a couple months, now we have all this great content that relates directly to those areas and is driving visitors back to the Proofpoint site. I would credit Brafton with the bulk of our growth on Twitter. I think we’re north of 2,500 followers on the main ProofPoint account, and that wouldn’t have happened if we didn’t have multiple news articles of original content going out every single business day. It’s really one of the favorite services that I’ve deployed in my time at Proofpoint. Brafton is extremely cost effective, they’re great people to work with, and I think the quality of the content is really high. Brafton’s understands the goals of what content marketing is for, understands the needs of growing companies to increase traffic, increase market presence and have a steady pulse of information going out. Brafton understands all of that, and that’s why I recommend the company’s services to everybody that I work with.